The Flotillas are a great way for you to connect with the PDQ community in a fun, relaxed and informal setting. They typically follow an informal itinerary where you are free to cruise and sightsee at your own pace and meet up at scheduled social rendezvous locations along the way. 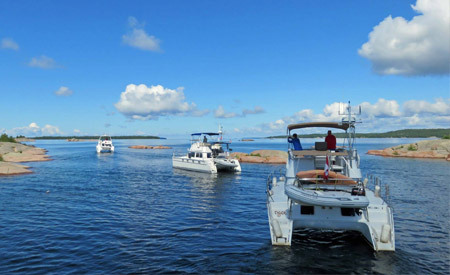 Our past flotillas have taken us as far as the Baltic Sea and Canada's extensive waterways, to exploring sights closer to home in the Bahamas, the Erie Canal and Florida's St. Johns River. We have been organizing Flotillas since 2003, leading PDQ owners through some of the most spectacular cruising grounds and enriching our boating experience and forming lasting relationships with other like-minded cruisers. 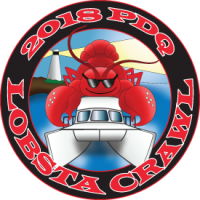 Any PDQ 34 or 41 powercat owner can participate in our flotillas. 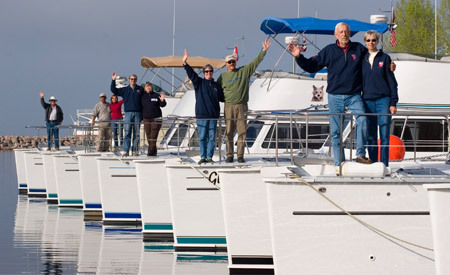 The flotillas are a great way to meet new owners and to benefit from the shared knowledge of the group for a more enriching boating experience. For first time cruisers, this has proven to be a great benefit in boosting confidence while being surrounded with local knowledge about the boat, cruising and liveaboard insights. As the neat row of PDQs meander their way through canals and rivers, we are constantly reminded of the wonderful bond we all share for the love of cruising, the lasting friendships formed on our flotillas, and our shared desire to be adventurous! Contact us to find out more and how you can participate in our upcoming Flotillas. These PDQ and Camano owners learn you don’t need a big boat to cruise the islands; you just need the right boat. Link to read a PDF of the full story published in Power Boating magazine.